There’s good news and bad news on the Mad Men front. The good news is that it’s coming back to AMC for a fifth season. The bad news is that ongoing contract negotiations are going to push the debut to early 2012. And those contract negotiations aren’t going so well. There’s a real possibility that series creator Matthew Weiner could walk. AMC is demanding a shorter running time for each episode, budget cuts that would mean two main cast members per year would have to leave the show, and more prominent product placement. Weiner is balking at those demands. He says the network is offering him more and more money to give in, but he’s offering to take less if AMC will back down on those demands. So far, AMC hasn’t budged. Thanks to President Obama, there has been a breakthrough in research into the causes of chronic tinnitus. Why some people with hearing loss develop tinnitus – a buzzing or ringing sound in the ears in the absence of any real sound -and others don’t has puzzled scientists for years. Almost all cases of tinnitus are preceded by a loss of hearing as the result of damage to the inner ear from aging, injury, or long-term exposure to loud noise, but experts estimate that only a third of those with hearing loss will go on to develop tinnitus. That amounts to nearly 23 million American adults annually in the United States. Researchers funded by an NIDCD challenge grant from the American Recovery and Reinvestment Act (ARRA) are suggesting a novel theory to explain why some people are more vulnerable to tinnitus than others. They propose that the limbic system – a linked network of brain structures involved in emotion, behavior, and long-term memory – acts as a gatekeeper to keep the tinnitus signal from reaching the auditory cortex, the part of the brain that mediates our conscious perception of sounds. In people with tinnitus, they suggest, the gate has broken. 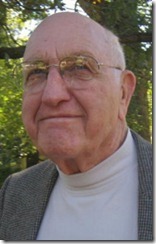 Their findings are published in the January 13, 2011, issue of Neuron. A professor at West Texas A&M may have developed an effective treatment for temporary relief from chronic tinnitus using a computer chip, software and a pair of headphones, and he hopes to have a device ready for local audiologists and hearing specialists to use by the end of the summer. If this treatment works, even temporarily, here’s hoping it can be rolled out nationally by next year. The chip sends a quiet and pre-programmed sound to the headphones, changing the channels sound takes to reach the brain. Dalton, in his third year at WT, likens the process to reorganizing roads to change the way a vehicle reaches a destination. Whatever conditions lead to tinnitus affect the brain’s normal functions, causing the ringing sound, he said. Dalton has seen some success with his work. Gretchen Mercer, who took Dalton’s treatment a few times during the past year, said the method completely removed her tinnitus whenever she put on the headphones. “Once we get to nano-technology, we can turn into a kind of hearing aid,” he said. Oh my gods. This video is so full of win my head’s gonna splode. Sometimes things are lost and never found. Sometimes bad things happen for no reason. Sometimes gravity changes and you fall into the sky, never to be seen again. Oh no, this is not good at all, not good at all. Just had the best idea for a short story I have ever had. Trouble is, I took my sleeping pills a few minutes ago. So here, let me waste my time writing this stupid blog post instead of writing down as much of the story as I can. Oh damn, now it’s gone. It was something about a transsexual clown stuck in a phone booth in 1942. Rats. Oh wait, there were rats in it too. Time traveling rats. From Mars. Dammit. Good night. 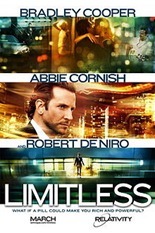 What’s not to like about “Limitless”? It’s got a compelling plot – a pill that makes you all you can be – an appealing lead in Bradley Cooper, it’s imaginatively and in some bits hypnotically photographed, and Robert De Niro even shows up to get a little work done. It’s a winner, worth the ticket price. I give it four and a half smart pills out of five. Fun thing to look for: The movie’s got loads of visual panache, but watch for the color saturation to change whenever someone takes a pill to increase their mental power. Side note: The idea that we only use 10% of our brains is a myth, most of us actually use 100% of our brains at different times. But don’t let that detract from a cool flick.